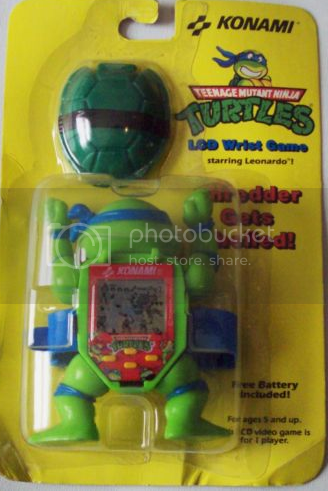 A Konami Teenage Mutant Ninja Turtles LCD Wrist Game from the early 1990s. Doesn't need to be in the package or anything, but would prefer it had the flip up shell. I got one of these as a gift as a kid and have since lost track of it, but would love to have one again. I just found mine. I think it still works but I have to replace the batery and find it out. I cant upload pics because of these message: Sorry, the board attachment quota has been reached. But may be we can get in contact by mail.